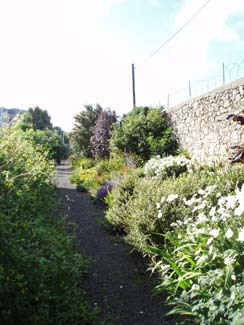 Walled garden with a penstemon collection, fine herbaceous borders, vegetable garden and interesting plants for sale. Opening Hours: WED 2PM - 4PM FOR GARDEN VISIT. MON - FRI 10AM -4PM FOR PLANTS SALES. An oasis in the midst of a commercial hub, the fine old walled garden of 1731 Burton Hall has a new incarnation as a teaching garden and is part of the training and rehabilitation programme for Cluain Mhuire. 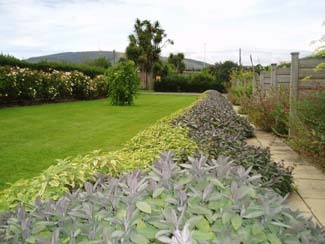 There are lots of enjoyable things for visitors to learn there too: how to revive an ancient bay hedge, how to run a square foot vegetable garden and effective ways to ward off pests with companion planting. Replanted from 1995 with begged and stolen plants (guaranteed to grow), the garden has matured beautifully. 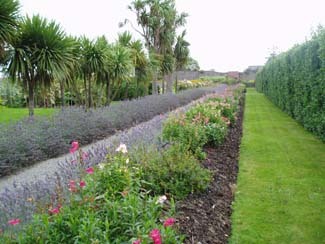 Yew, bay and beech hedges delineate different areas within the garden: an arboretum, a parterre, a fruit garden, and a central walk bordered with lavender, penstemons and R‘Perle d’Or’. The vegetable garden is planted with unusual crops like physalis, pumpkins, Chinese mustard, purple podded peas and Pak Choi. Around the walls are glorious herbaceous borders with interesting plant associations Chephalaria gigantea, eremerus with yellow thalictrum and Romneya coulteri, named after Romey and Coulter the two Irish men who discovered it. Burton Hall is also a place where children can marvel at the tallest of trifid-like echiums, where strollers can sit on intriguing sculptured seats by James Carroll and see statuesque Puja chilensis,which grabbed the headlines as one of the first to flower in Ireland. Tempting plants propagated from the garden can also be purchased. HARDY EXOTICS, GRASSES, LATE SUMMER PERENNIALS. FROM M50 EITHER DIRECTION TAKE EXIT FOR SANDYFORD. TURN RIGHT AT LIGHTS AT BEACON CLINIC AND FIRST RIGHT AGAIN. FOLLOW ROAD TO T-JUNCTION WITH AIB ON THE RIGHT. RIGHT AT T-JUNCTION AND RIGHT AT NEXT LIGHTS. TAKE NEXT LEFT ONTO ARENA ROAD AT WOODIES AND BURTON HALL IS OPPOSITE JAGUAR / LANDROVER / VOLVO GARAGE.